In HCB’s seminal book, in English called “The Decisive Moment” and in French “Images à la Sauvette” (1952), HCB assembled a selection of his photographs of various subjects, in a novel style that was made possible by a small, nimble hand-held camera, in the hands of a master, who had a great eye and a classical background in composition. The book has come to be, perhaps, the most important book ever published in the field of photography. The HCB paradox, in my mind is one of reconciling the idea behind the two titles of his book. In English The Decisive Moment, in French translated into English Images on the Run. Arguably HCB did both, he found the exact moment to take a photograph. He did so with great composition and great command of light and shadow. However, the concept of the decisive moment is based on perfect composition and perfect content, but to make a photograph at the decisive moment, you have to wait for the decisive moment. You have to be patient. You compose your image in the view-finder, you set the graphic elements and ensure that the light and shadow elements will work in the final black and white print, and then you wait. You wait for the right element to enter the photograph, usually this is people, a dog, a car or another moving object and you press the shutter when the moving element is in the perfect position in the composition you have prepared for it. This is the Decisive Moment. A good example is the bicycle rider in the 1932 image from Hyères in the south of France. The graphic elements of the staircase, the position of the photographer above the subject, and the stairs, walls and building all round, create the perfect setting. The perfect light and shadow elements form the perfect frame for the lone bicycle rider that comes along the cobble stones on the road below. Images on the Run, on the other hand, suggests that you lift the camera, compose the image on the fly and capture the moving elements perfectly within the field of the viewfinder. All in a fraction of a second. This requires not only incredible luck and intuition when it comes to the compositional, or graphic elements, but also the moving elements have to be just perfect. While I would argue that this happens, it does not happen often, and certainly not every time. 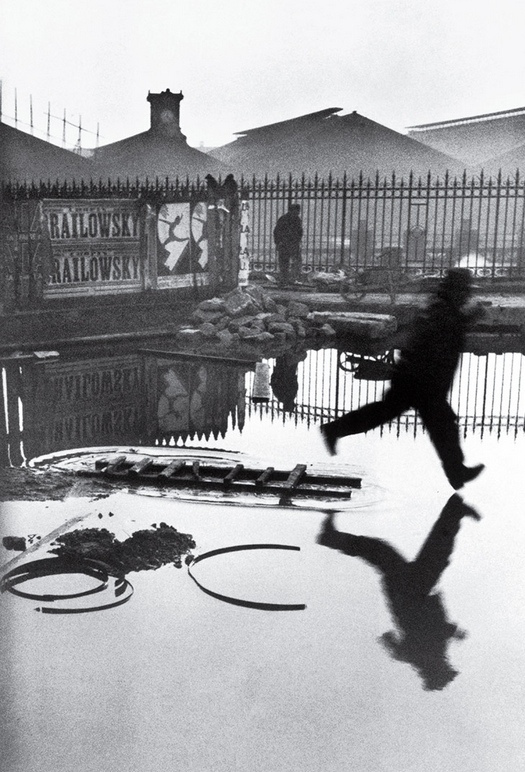 A prime example of this would be HCB’s Behind the Gare Saint Lazarre, which captures the jumping figure and his reflection in the standing, perfectly still water, with a poster in the background of a circus artist in a strikingly similar position as the jumper in the foreground. There would have been only a second or two to anticipate this shot and certainly no time to prepare. Lucky? Perhaps, but it still takes a great eye to make this come together. 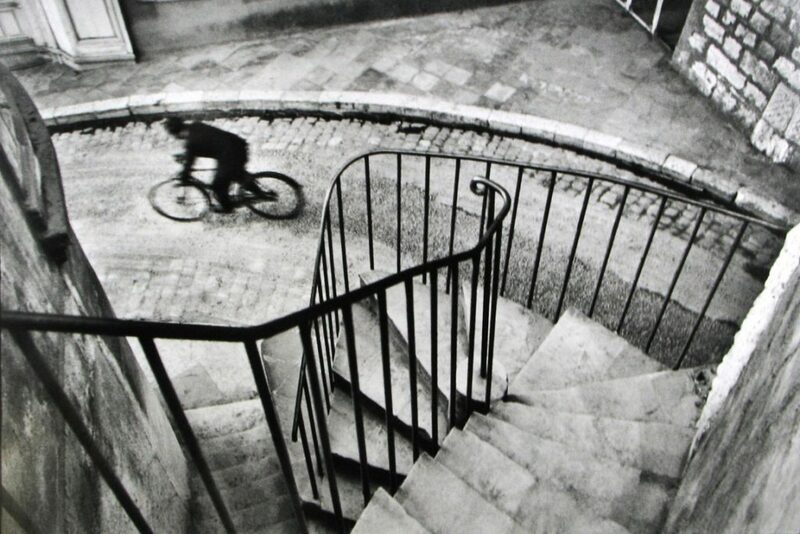 The contradiction in these two photographs is that in the first, the one from Hyères, it is 99% sure that the composition was created, and the shutter pushed down only when the bicycle appeared below. Arguably, HCB might have seen a bicycle come across the field, followed by him setting up the shot and waiting for the next bicycle, however, unlike the Saint Lazarre image, where HCB could see in advance that the figure was going to come across the boards and would perhaps jump, giving him time to raise the camera and press the shutter at the perfect moment, the shot with the bicycle could not be anticipated, as the bicycle would have come from behind the building to the right at some speed, and there simply would not have been time to even raise the camera. This interpretation of the two book titles, perhaps illustrated with the two examples above, creates part of the mystique around HCB. He nursed this mystique. It is said that he buried a small box of negatives – individual negatives cut from whole rolls – in his garden before the outbreak of World War II. The mystique is augmented, as some of these negatives are among his most celebrated. They date from the 1920s and 30s and are in many cases iconic. However, in saving individual negatives only, as opposed to entire rolls of film, you cannot see, if he took 30 photographs to get the one with the bicycle…. Perhaps there was one with a pedestrian, one with a pram, one with a car, and so forth, and he selected the one with the bicycle. There is no way of knowing how the decisive moment was achieved. How many shots it took before the bicycle came along. It is more than likely that there would have been several photographs from the same spot before the bicycle came along. We will never know, and I am convinced that HCB liked it that way. The box of individual negatives contributed greatly to the legend that he became and cemented in his followers his incredible ability to compose every frame perfectly every time. We will never know how many photographs of the same scene would have appeared over and over again with variations in the key moving elements, until the right one came along and the decisive moment occurred. Why is this important you ask? Well, I think the majority of HCB’s iconic images are actually very carefully composed frames with moving elements captured just at the right time. As opposed to simply lifting the camera at the right second and by magic shooting at the same time as designing the composition within the frame, as would be the case with the ‘photographer on the run’. This is by no means a scientific analysis of the master’s work, nor is it a critique of the man’s incredible skill and his wonderful photographs, it is my interpretation of how he nursed his own legend and at the same time suggested that compositional, framing elements were everything, but that the fraction of a second when the decisive moment happened was also everything and somehow the compositional elements came together with the moving elements in a decisive moment, in a spontaneous, not pre-planned fashion. This is pure fabrication. Perfect composition, lighting and the moving elements do not just come together in the 1/125th of a second that one might shoot in today, or the 1/50th of a second that HCB would have shot at in the middle of the last century. Yes, it can happen. Yes, experience will help with the composition elements. But it is not something that happens over and over again and just for HCB. I am not suggesting that HCB’s photographs are not mind-blowing and that the sheer volume of his incredible photographs are not awe-inspiring for any photographer, what I am saying is that a great number of his photographs are carefully composed in advance and taken once the moving, critical element entered the frame in exactly the right position and the shutter was pushed. Of course, lots of HCB’s photographs are absolutely taken on the run, but often the compositional elements are not quite as strong, and the action, or the moving elements, as I call them, tend to be a little more centered in the frame, as would be natural, if you see something happening, you raise and point your camera, and press the shutter, all in a matter of a split second. In conclusion: HCB did both the well-composed decisive moment photographs and the images on the run photographs. So, perhaps it is appropriate that his collection of photographs published to such great effect in 1952, in a somewhat convoluted manner had both titles. The result is a collection of both carefully composed images, where behind the scenes, an entire roll might have been committed to get just the right moving element, and images that were a result of a split second decision to shoot, where a roll might actually contain 36 completely different photographs. HCB was superb at supporting his own legend, and had a reputation for harshly critiquing mentees who broke his rules for strict composition and perfect timing for the moving elements. He was a great photographer, but the legend that all his photographs were split-second decisions, where he just happened to be exactly in the right place, in the exact right position, in the 1/50th of a second where the whole thing came together in his view-finder just so, is entirely the stuff of legend and a carefully nurtured legend at that, which HCB seems to have enjoyed thoroughly. His writings, his quotations, his legendary privacy, hatred of having his picture taken, all have fed the reputation and formed the iconic legacy that he enjoyed during his lifetime, and beyond. “For me the camera is a sketch book, an instrument of intuition and spontaneity, the master of the instant which, in visual terms, questions and decides simultaneously. In order to ‘give a meaning’ to the world, one has to feel oneself involved in what one frames through the viewfinder. This attitude requires concentration, a discipline of mind, sensitivity, and a sense of geometry – it is by great economy of means that one arrives at simplicity of expression”. This is the stuff of legend, and for the average photographer the kind of stuff that makes the knees knock and the hands shake. And while it can certainly happen, it is the exception rather than the rule, because as a rule with HCB, composition came first, and more often than not, the moving elements were the result of patience and multiple efforts before achieving the final result. The quote is revisionist, and designed to further fuel the legend. It doesn’t diminish the value or the incredible number of magnificent photographs that the master produced during his long career, but it does make him human. At least a little more human than the legend might otherwise suggest.